Weekly Acts of Kindness - Free Tastes Good! We are on our third year, week six of our 365 Days of Kindness Challenge. This has been a fun week of random acts of kindness as you can see in the video above. We love to make this a family affair and have our kids participate in each act that we do or they can choose one they like to do. We had a snow storm this week and we dropped off a box of bath tissue to our good friends as they ran out last year during the snow storm so it was a fun thing for the kids to do. They dropped it on the porch and ding dong ditched them LOL 🙂 We have our kids partaking in all the events so they can see the importance of passing the blessing on and helping others. You can tweak each act however you like or change the order, but these are just simply suggestions and ideas. As most of you know, we are BIG on giving back to our community and showing God’s love to as many as we can. Many of these acts of kindness cost very little and some are even FREE. Our goal is to change our communities, one act of kindness at a time. We always pray before we do our acts and ask God to bless the recipient. Matthew 25:40. If you have ideas and/or suggestions, please comment and let us know. We are excited to see what God has in store for year #3 of the 365 Days of Kindness. We always attach one of the 365 Days of Kindness Cards. The purpose of printing the cards is that the recipient can then recycle it and pass the card on by doing another random act of kindness. They can also come to the page and tell their story of giving and/or receiving the blessing. Our vision is that each card will be passed to 365 people each year. Print the FREE Act of Kindness Cards by CLICKING HERE. Day 35 – Text or send a handwritten note to someone who has made a difference in your life. 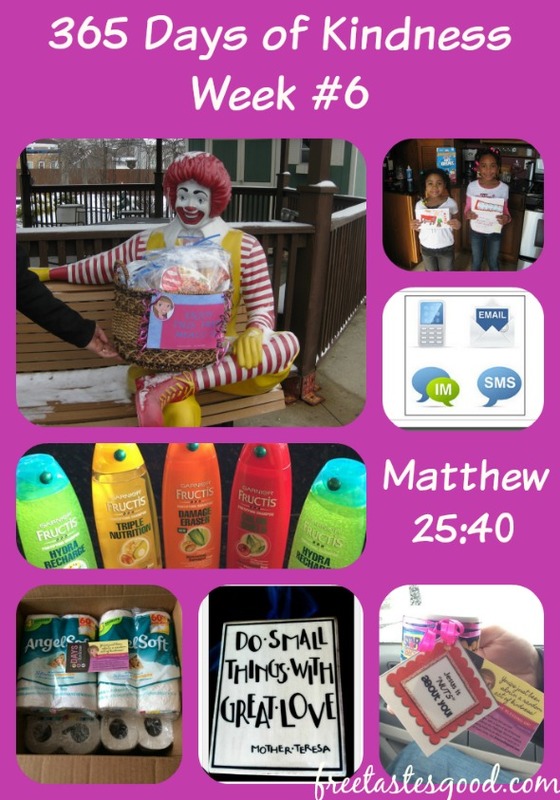 Day 36 – Take a canister of nuts that says “Jesus is Nuts about You” to a nursing home or assisted-living place to bless someone that does not get much company. Go here to print the Jesus is Nuts about you Card. Day 37 – Send a “thinking of you” or “encouraging” card to a complete stranger by using the white pages on the computer. (By the end of the year our goal is for EVERYONE to have sent a card to a stranger in every state) – CLICK HERE to see how we pick that RANDOM person. Day 38 – Bake cookies or cupcakes or any treat (even store bought) and take to a public service worker, i.e. fire station, police station, etc. Day 39 – Donate 5-items (nonperishable or hygienic) to a local food bank, shelter, or family you may know in need. 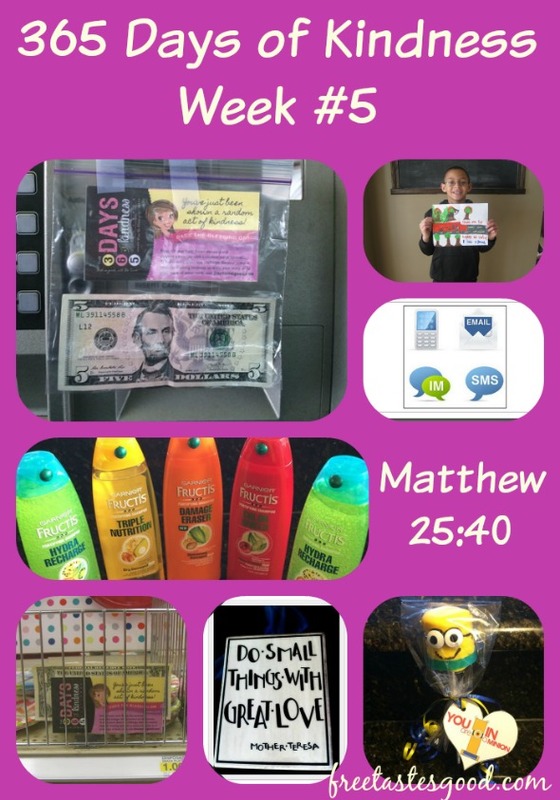 We are on our third year, week five of our 365 Days of Kindness Challenge. This has been a fun week of random acts of kindness as you can see in the video above. We love to make this a family affair and have our kids participate in each act that we do or they can choose one they like to do. Isaiah was talking kind of softly, but you can still see what he was doing 🙂 We have our kids partaking in all the events so they can see the importance of passing the blessing on and helping others. You can tweak each act however you like or change the order, but these are just simply suggestions and ideas. As most of you know, we are BIG on giving back to our community and showing God’s love to as many as we can. Many of these acts of kindness cost very little and some are even FREE. Our goal is to change our communities, one act of kindness at a time. We always pray before we do our acts and ask God to bless the recipient. Matthew 25:40. If you have ideas and/or suggestions, please comment and let us know. We are excited to see what God has in store for year #3 of the 365 Days of Kindness. Day 26 – Tape money to an ATM machine. Day 28 – Text or send a handwritten note to someone who has made a difference in your life. Day 29 – Give a gift to someone who has made a difference in your life. We choose our 2 officers that keep us safe at all our outreach events. Day 30 – Send a “thinking of you” or “encouraging” card to a complete stranger by using the white pages on the computer. (By the end of the year our goal is for EVERYONE to have sent a card to a stranger in every state) – CLICK HERE to see how we pick that RANDOM person. Day 31 – Bake cookies or cupcakes or any treat (even store bought) and take to a public service worker, i.e. fire station, police station, etc. Day 32 – Donate 5-items (nonperishable or hygienic) to a local food bank, shelter, or family you may know in need. We are on our third year, week four of our 365 Days of Kindness Challenge. This has been a fun week of random acts of kindness as you can see in the video above. We love to make this a family affair and have our kids participate in each act that we do or they can choose one they like to do. Jadyn said she was a little nervous being on camera LOL 🙂 We have our kids so involved so they can see the importance of passing the blessing on and helping others. You can tweak each act however you like or change the order, but these are just simply suggestions and ideas. As most of you know, we are BIG on giving back to our community and showing God’s love to as many as we can. Many of these acts of kindness cost very little and some are even FREE. Our goal is to change our communities, one act of kindness at a time. We always pray before we do our acts and ask God to bless the recipient. Matthew 25:40. If you have ideas and/or suggestions, please comment and let us know. We are excited to see what God has in store for year #3 of the 365 Days of Kindness. Day 19 – Tape a book of stamps to the Kioski at the Post Office. Day 21 – Text or send a handwritten note to someone who has made a difference in your life. Day 23 – Send a “thinking of you” or “encouraging” card to a complete stranger by using the white pages on the computer. (By the end of the year our goal is for EVERYONE to have sent a card to a stranger in every state) – CLICK HERE to see how we pick that RANDOM person. Day 24 – Bake cookies or cupcakes or any treat (even store bought) and take to a public service worker, i.e. fire station, police station, etc. Day 25 – Donate 5-items (nonperishable or hygienic) to a local food bank, shelter, or family you may know in need. We are on our third year, week three of our 365 Days of Kindness Challenge. This has been a fun week of random acts of kindness as you can see in the video above. We love to make this a family affair and have our kids participate in each act that we do or they can choose one they like to do. You can tweak each act however you like or change the order, but these are just simply suggestions and ideas. As most of you know, we are BIG on giving back to our community and showing God’s love to as many as we can. Many of these acts of kindness cost very little and some are even FREE. Our goal is to change our communities, one act of kindness at a time. We always pray before we do our acts and ask God to bless the recipient. Matthew 25:40. If you have ideas and/or suggestions, please comment and let us know. We are excited to see what God has in store for year #3 of the 365 Days of Kindness. Day 12 – Find a parking meter and tape some money to it! Day 14 – Text or send a handwritten note to someone who has made a difference in your life. Day 15 – Pay for a person’s Dry Cleaning Bill, so when they pick it up, it will show “paid in full”. Day 16 – Send a “thinking of you” or “encouraging” card to a complete stranger by using the white pages on the computer. (By the end of the year our goal is for EVERYONE to have sent a card to a stranger in every state) – CLICK HERE to see how we pick that RANDOM person. Day 17 – Bake cookies or cupcakes or any treat (even store bought) and take to a public service worker, i.e. fire station, police station, etc. Day 18 – Donate 5-items (nonperishable or hygienic) to a local food bank, shelter, or family you may know in need. Is anyone else as excited as I am?! We are on year number 3, I truly cannot believe it, but how EXCITING!! We are doing it a little different this year as we will try (God willing) post the videos and ideas a week in advance. Please remember this is just a list of random acts of kindness ideas, but you can tweak them anyway you want or you may choose not to do them at all. If you have ideas and/or suggestions, please comment and let us know. We are excited to see what God has in store for year #3 of the 365 Days of Kindness. If you want more details of each individual day, just click on the links below. Also if you want to print the FREE Act of Kindness Cards – CLICK HERE. The purpose of printing the cards is that the recipient can then recycle it and pass the card on by doing another random act of kindness. 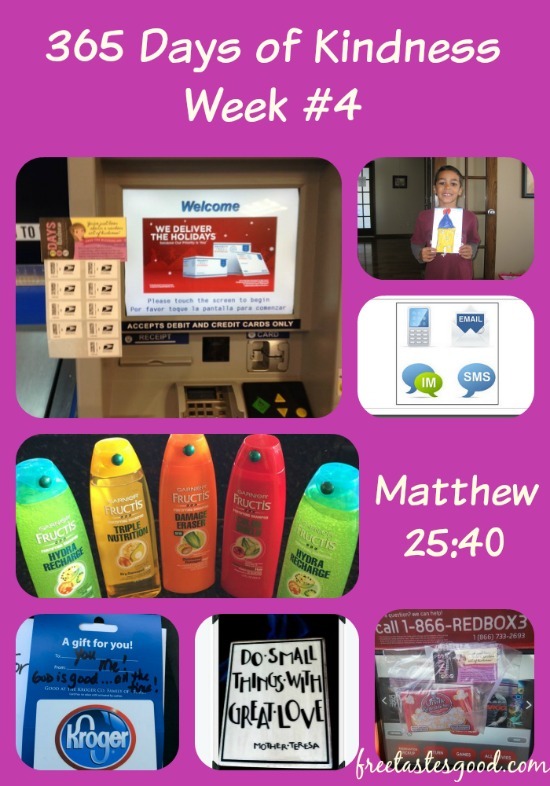 Day 5 – Find a gas station and tape some money to the pump! Day 7 – Text or send a handwritten note to someone who has made a difference in your life. 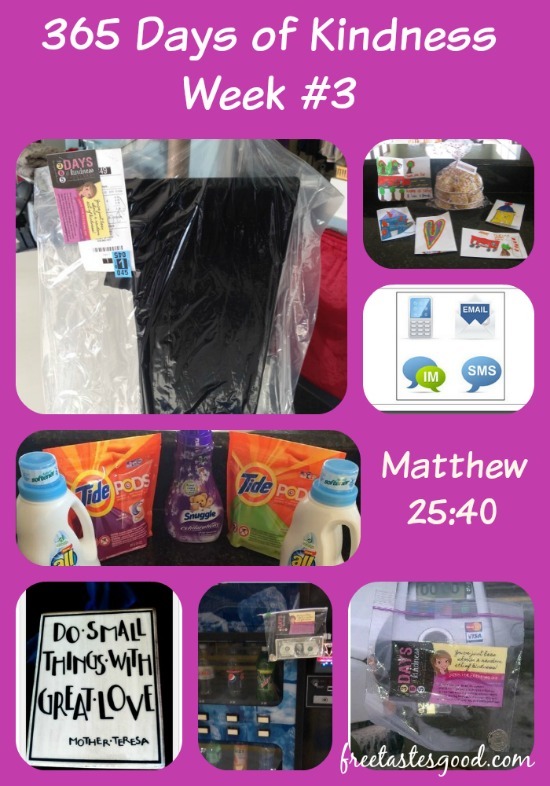 Day 8 – Make up a care package for the homeless or a homeless shelter. Day 10 – Bake cookies or cupcakes or any treat (even store bought) and take to a public service worker, i.e. fire station, police station, etc. Day 11 – Donate 5-items (nonperishable or hygienic) to a local food bank, shelter, or family you may know in need. 365 Days of Kindness ~ Week #1 ~ PASS THE BLESSING ON!! Is anyone else as excited as I am?! We are on year number 3, I truly cannot believe it, but how EXCITING!! We are doing it a little different this year as we will try (God willing) post the videos and ideas a week in advance. Again please remember this is a list of random acts of kindness, but you can tweak them anyway you want or you may choose not to do them at all. If you have ideas and/or suggestions, please comment and let us know. We are excited to see what God has in store for year #3 of the 365 Days of Kindness. Day 1 – Go through a drive thru and pay for the car behind you!! Day 2 – Donate a bottle of laundry detergent or fabric softener to a local laundromat and included a tag that says “Take Me I’m FREE”. You can print the tags HERE. Day 3 – Bake cookies or cupcakes or any treat (even store bought) and take to a public service worker, i.e. fire station, police station, etc. Day 4 – Donate 5-items (nonperishable or hygienic) to a local food bank, shelter, or family you may know in need.